Once I confessed this to another mom, who surprised me by confessing the same thing back. I felt so relieved. (And so did she.) I told her that every Sunday I think I’m not cut out to be a mom, and she told me, “Every day I think I’m not cut out to be a mom.” So we lamented together, and we laughed together, and I was so relieved to know I’m not the only one who thinks she’s failing in this motherhood venture. One Sunday I was feeling particularly discouraged about motherhood. My husband was praying with and ministering to teenagers. This is something I love doing with him, and I miss it. (For our family’s sake, I stepped back from youth ministry when I became pregnant with our third child.) So instead of participating in shiny, glittery youth ministry, I was responsible for the mundane task of picking up my kids from their Bible classes — and proceeding to keep an eye on them afterwards. That morning in particular, I had an intense feeling of missing out on the good stuff. I sat there, all alone and lonely, when another woman came up to me and started a conversation. Suddenly I didn’t feel so lonely. As we talked and shared about life, I discovered that she, like me, needed some encouragement. That she, like me, dislikes conflict. I felt so relieved. I’m not the only one!? I had been feeling so useless. And I thanked God for His kindness: He sent me one of His own to encourage me. He didn’t have to, but He did. And neither did He let me walk out of church that morning feeling as utterly useless as I had begun. One day I was surprised to hear a Christian I really respect talk about the struggle to find time for God in the chaos of overcommitment. I literally breathed a sigh of relief. I’m not the only one!! When I accept too many social or ministry commitments, I struggle to find time to spend with God. And it’s hard for me to say “no.” I felt less like a failure knowing that someone I love and respect also struggles with setting boundaries with their time. I felt less like a failure knowing I’m not the only one whose overcommitments interrupt their tight connection with God. I tend to look at Christians I respect and think they don’t have struggles anymore. I tend to white wash their humanity, to view them through a lens so hazy I can’t see any flaws, to assume that one day, they just “arrived” and must surely be consistent in fighting against sin and in consecrating their time to God. But I’m always relieved when I learn I’m not alone in whatever struggles I happen to be facing. Community with other believers is where we learn we’re not alone. It’s where we collect our precious “Me too” moments. Ah the joy and relief of a “Me too” moment! Nothing compares. These “Me too” moments are the ties that bind. They are the mutual woes, the mutual burdens we bear. We share our fears, our hopes, our aims, our comforts, and our cares. 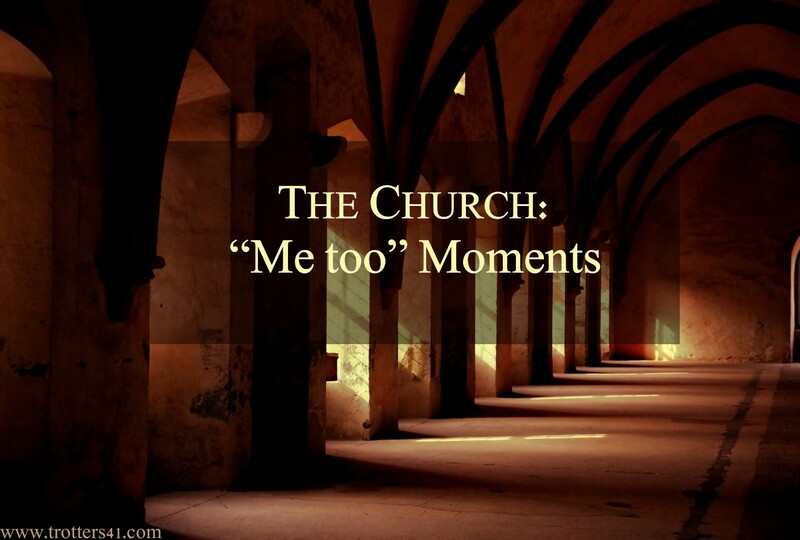 * It’s what I love about the Church: endless opportunities for “Me too” moments. “Not far away from us, there is someone who is afraid and needs our courage; someone who is lonely and needs our presence. There is someone hurt needing our healing; unloved, needing our touching; old, needing to feel that we care; weak, needing the support of our shared weakness. I find myself nodding and saying “Me too” pretty much every time I read your writing. Definitely resonate with you on this one. Grateful for you. Thanks Danielle! I’m grateful for you, too. 🙂 And I agree, “Me too” moments happen both in real life, and online. Yes, I’ve had many of those “me, too” moments. It helps to know we’re not the only ones facing doubts or struggles.